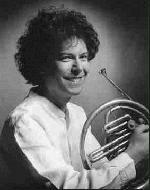 Stephen Stirling is a renowned chamber musician and soloist. He has played concertos with the Academy of St. Martin-in-the-Fields, the City of London Sinfonia, and the Chamber Orchestra of Europe. In addition to the Fibonacci Sequence he is a member of several chamber ensembles including Endymion and Capricorn with whom he has made numerous CDs and appearances on radio and television. Recent engagements included concertos at the Barbican, Royal Festival Hall and on BBC Radio 3. His CD of Mozart's horn concertos on the Classic FM label is constantly broadcast on Classic FM radio. Recent projects include a concerto commission from Gary Carpenter, and his CD with the Fibonaccis of chamber music for horn was released in 2007.